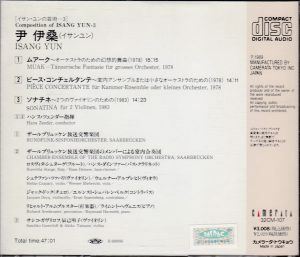 I hope that the relative neglect in which Isang Yun has fallen after his death won’t last too long, because he is in my opinion one of the most profoundly original composers of the late 20th Century. Rooted in the most cutting-edge and thorny German avant-garde of the 1950s and 1960s, Yun invented a uniquely personal and uniquely fascinating language when he allowed his radicalism to be cross-bred by the melismatic traditions of Chinese and Korean Court-Music. The result was a kind of music that is, if you have the ear to hear it, intensely, even achingly lyrical, but never in a heart-on-sleeve or sentimental manner, never relinquishing its compositional exigencies. Pièce Concertante, from 1976, may seem tougher to take, because its chamber-size affords less lushness of sound and sharper instrumental edges. But it is also a work of great refinement in the embroidery of its instrumental lines, its strange and exotic violin melismata in the highest registers, the constant tipsy glissandi and quarter-tone oscillations, the nervous and troubled dialogue of flute and clarinet sounding like frantic exotic birds (7:17), the gossamer punctuations of percussions. It too alternates between moments of poetic contemplation and outbursts of agitated energy. 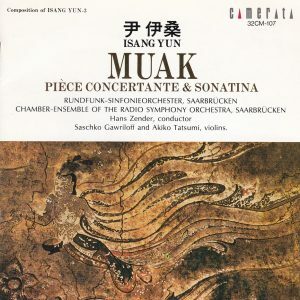 With the Sonatina for 2 violins (1983) one gets, after his scoring for large orchestra and chamber ensemble, an example of Yun’s instrumental compositions. The same exacerbated lyrisicm imbues the piece, more bare but perhaps even more intense as we have here only two violins engaging in a kind of competition of glissandi, trills in the highest registers and other exotic melismata. The music of Yun often evokes some wild and strange aviary from another planet. TT is a short, LP-determined 47 minutes. 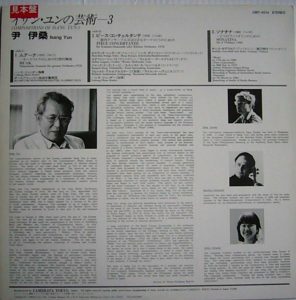 The Japanese label Camerata did great service to the admirer of Yun’s music when they issued, between 1987 and 1997, the 11-CD survey of his music, “Compositions of Isang Yun”, of which this is volume 3 (the first volumes were released in the early 1980s on LP, and the last volume, released some years after the others, wasn’t numbered as part of the series and was only titled “Last works of Isang Yun”). This is how I have them. 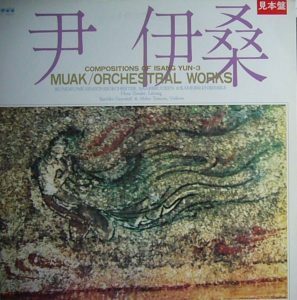 In 2009 they reissued their Yun collection on a 9-CD series titled “The Art of Isang Yun”, and did some reshuffling on the occasion. In the original series, the pairings were rarely entirely consistent, mixing orchestral and chamber, and various performers. The reissued series is genre-centered, with three volumes of orchestral, two volumes of concertos, and the remainder of chamber and instrumental music. Also, stacking the contents of the original eleven CDs on only nine, each offers more generous timings, almost always over 70 minutes, while those of the original series ran to about 60-minutes each, and sometimes, as is the case here when straight reissues from LPs, even less. Go to my Isang Yun introductory page for the table of correspondence between both editions. As for the contents of this volume 3, Muak has been dispatched on Art-1 with Symphony No. 1 from Compositions-6, Pièce concertante on Art-6 “Chamber Music I” (with Loyang from Compositions-6, Salomo, Gong-Hu, In Balance from Compositions-9) and Sonatina on Art-9 “Chamber music IV” (with Königliches Thema, Gasa and Contrasts from Compositions-8).